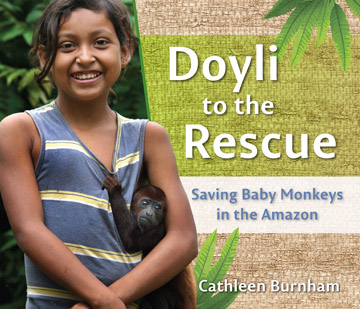 Doyli to the Rescue, Saving Baby Monkeys in the Amazon. Photos and text by Cathleen Burnham. Crickhollow Books, Milwaukee, WI 2015. When Cathleen Burnham’s family took a vacation in the Amazon, it was just the beginning of a longer story about how kids can save a little part of the world. As her family traveled down the Amazon River, Burnham spotted a hut surrounded by playful monkeys. When the tour guide told them “The family that lives there takes in orphaned…monkeys,” she begged to visit. Once there, they met Doyli, a ten-year old girl, who helps save baby monkeys and release them back into the wild. How the three stories of the Yagua, the American and the young girl intersect gives the reader a fascinating look into the lives of the people of the Amazon rain forest. Doyli lives in Peru, as does the hunter. He must feed his family, but when he kills a mother monkey he finds a baby left behind. He takes the youngster to Doyli, knowing that the young girl will feed and shelter the baby until he is old enough to be set free. Burnham does not judge the Yagua hunter. He must feed his family, that is a given. But he understands that when a mother monkey is killed and a baby left behind, the cycle of life must be protected. He knows that with Doyli, there is shelter for the young monkey. There is, however, a dark side to the story. One day, Doyli and her uncle visit the public market, where Doyli spots a man selling a baby monkey. She knows that thieves kill monkey parents and then take the babies to sell at the market. Doyli tells her uncle and he informs the police. The man is arrested and the baby he was trying to sell is given to Doyli to be cared for. This is a beautifully photographed book with an important story that shows readers you don’t have to be a grown-up to make a difference. In the author’s note, Burnham explains that there is an organization, the World Association of Kids and Animals (WAKA), that shares the stories of children, like Doyli, who are helping to protect animals all over the world. Burnham says she’s interviewed many children with stories similar to Doyli. I look forward to reading those stories in the near future.